Our family was biking through our neighborhood when I spotted a good-sized bird in the bushes between the road and a large lagoon. Fortunately, I had my little pocket digital camera in my shorts pocket – a habit that I’ve found to pay big dividends for this blog! What a beautiful bird – and to think that most people driving by would never see or appreciate it! What a wonderful place the Lowcountry is! 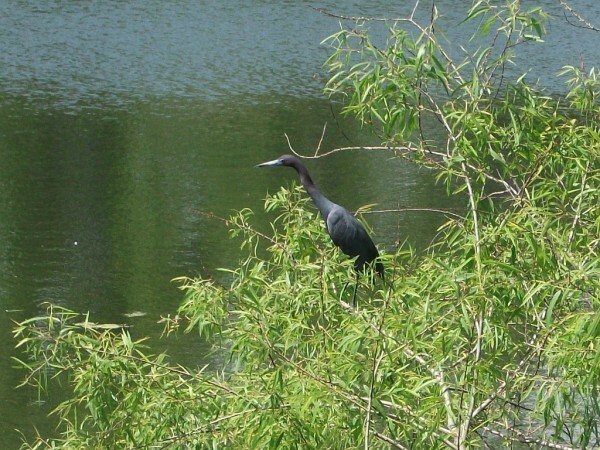 Posted in: Birdwatching Stories,Lowcountry area,N.I.M.B.Y. The northeast end of Hilton Head Island where the Port Royal Sound empties into the Atlantic Ocean is a “hot spot” for shorebirds to gather, especially during spring and fall migration. 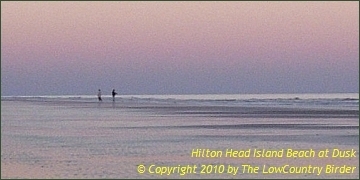 The Town of Hilton Head Island has preserved a large area of land along Port Royal Sound as part of Fish Haul Creek Park, which includes a tidal creek, marshlands, maritime forests, and a stretch of sandy shoreline. This video provides views of the area from the shoreline, looking first up into Fish Haul Creek and its marshland area, then going around the shoreline and the “Port Royal Flats” area where hundreds of gulls, terns, skimmers, sandpipers, pelicans, herons, and egrets gather to feed, rest, and “hang out” on the sandbars. It started as a peaceful summer afternoon in the lagoon behind our house: two Yellow-bellied Slider turtles relaxed on a floating log, enjoying the sunshine amid the languid waters. But when a third turtle decided to join them, MAYHEM broke out – and the ensuing “Log-rolling Olympics” had the turtles scrambling to stay afloat! Mr. Bluebird on my … Rear-view Mirror? Every once in a while, the interactions between humans and nature produce some, er … unexpected results. Something as innocent as my neighbor leaving his truck parked in his driveway – nothing wrong with that, right? – can cause a seemingly harmless and innocent creature to fly into a rage. When one thinks of an Eastern Bluebird, images of a beautiful, gentle bird come to mind. After all, they are bedecked in bright royal blue and orange colors, and often are set upon by their randy immigrant neighbors, the House Sparrows and the Starlings (both introduced from Europe), who compete with the Bluebirds for nesting holes in the neighborhood. But perhaps some Bluebirds have had all they can stand and aren’t going to take it anymore! At least this one seemed to be ready to defend his territory against all comers – even another “phantom” Bluebird!